Big Grey Man of Ben MacDhui will be making an appearance at the Moray Walking & Outdoor Festival as part of the Moray Speyside Film Club Outdoor night at Moray College UHI, Elgin. Scotland's Midsummer Walking Festival runs from 16-25 June 2017. The film night is on the Tuesday, 20th June. Here's the full version of the film, at last. Enjoy. The Big Grey Man of Ben MacDhui was featured on the 4Talent web site this month. As well as talking about the film project, the article is a good introduction to one of our next projects, thehighlands.com. We were delighted to see The Big Grey Man at this year's Kendal Mountain Film Festival. Richard and John got down there, and there's some Kendal reportage over at The Highlands.com. The Big Grey Man of Ben MacDhui made an appearance in the Dalwhinnie Pavilion at The Outsider Festival near Aviemore, at Midsummer this year. 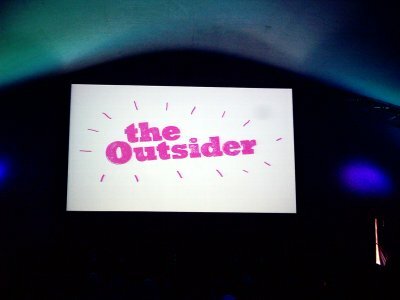 We were very pleased to be able to show the film at The Outsider Festival, in the heart of the landscape within which it is set. Did you see the Big Grey Man? If so, let us know! We were delighted to be awarded the Best Highland Amateur Film 2007 prize at the Fort William Mountain Festival. John and Rick were up to collect the prize, and a good night was had by all. Next news will be when we release the full film on YouTube, Midsummer 2007. The Big Grey Man of Ben MacDhui was featured in The Herald newspaper in Scotland today. If you didn't manage to catch it you can read an abstract, and access the full story here. 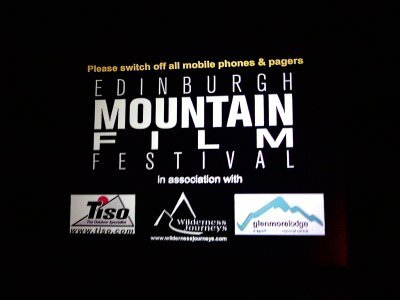 We are delighted to learn that The Big Grey Man of Ben MacDhui made it into the lineup at the Edinburgh Mountain Film Festival 2006. The festival was a great success. It was fantastic to see Big Grey Man of Ben MacDhui on the big screen along with all the other films in a packed and exciting programme. We were on in the Saturday morning slot, following Jamie Andrew and friends' very moving film about their ascent of Kilamanjaro. I think everyone who saw it was inspired by their stories, and it was certainly a hard act to follow. Also in the morning session was 'Fisherfield', the second film from the folk who bought us 'Bothy' at the 2005 Edinbnurgh Mountain Film Festival, and inspired us to have a go at making a film. At the 2006 awards E11 cleaned up, the film about Dumbarton Rock from Hot Aches went down a storm. A really good film festival to have been a small part of, we enjoyed ourselves immensely. In 2005, a team of hill-walking associates from scottishhills.com decided to make a film. Inspired by pieces like Bothy at the Edinburgh Mountain Film Festival that year, the initial idea was to try and make something that combined a shared appreciation of Scottish mountain scenery, with an excuse to get out more over the winter of 2005/2006. The Cairngorm mountains and the related legend of the Big Grey Man of Ben MacDhui were swiftly lit upon as likely themes, and a series of short winter and spring outings were planned. Research was undertaken to find interviewees who might have either heard, seen or felt a mysterious and frightening prescence on the Cairngorm plateau. 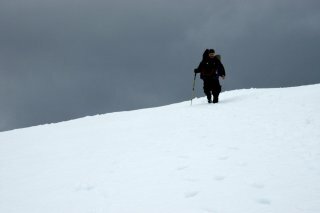 The film team spent a long dark winter solstice at Corrour, and returned to walk the Lairig Ghru in spring snow. A further short expedition overnighted on the summit of Ben MacDhui in search of the mysterious Big Grey Man. Further trips were made to speak with local figures from Aviemore and Braemar, and the resulting documentary film explores with them legend, the evidence and possible explanations for the strange presence said to stalk the slopes of Ben MacDhui. The film was a collaborative project by members of the scottishhills.com hill walking community. Richard had the idea to make a film after visiting last year's Edinburgh Mountain Film Festival. He helped shape and guide the film. Jez is a film maker, and was both cameraman and editor on The Big Grey Man of Ben MacDhui. Peter helped co-ordinate expeditions during the shoot, organised parts of the project, and now looks after the web site. In his spare time he's an IT consultant. Some of us think Dave is The Big Grey Man of Ben MacDhui. John's the real winter mountaineer on the team. He keeps us safe in the hills. Founder of scottishhills.com, Chris added a fair few Munros to his tally during the making of the film. A stalwart member of the scottishhills.com 'Gourmet Division', Graham kept us in venison casserole at Corrour Bothy but then fled in fear to New Zealand. He now heckles from the sidelines. 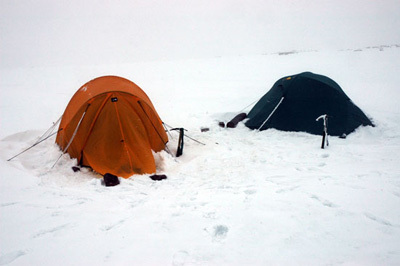 On April 30th some of us spent the night camped in the snow, about 20 metres below the summit of Ben MacDhui. 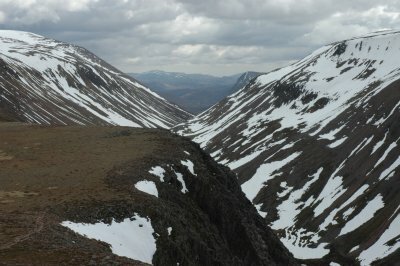 On the way up, we filmed from Lurchers Crag, the precipitous cliffs flanking the Aviemore end of the Larig Ghru. Good conditions on ascent, through increasing snow cover. By early evening we had the mountain to ourselves, and as darkness fell, cloud descended and the wind picked up. Hunkered down in one tent, the team had a drum up, and listened as 25mph gusts battered the tent. Brief forays outside saw considerable icing. A foot of snow fell overnight. Aiming to be up to film the May Day dawn, heads out the tent around 4am saw nothing but a howling grey clag, so we gave it a miss and got back in the sleeping bags. 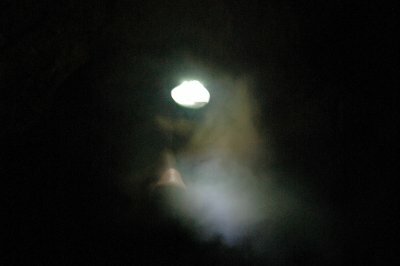 Walked out in a heavy mist, good navigation required, you'd lose sight of each other within 30 feet at times. Easy to imagine getting lost, being alone up there, seeing shadows in the freezing fog. Our second trip to Ben MacDhui took place around 21st March. Six of us hiked in through the Chalamain gap in spring snow. There was a category 4 avalanche warning in place, and it looked windy on the tops, so we elected to head for Corrour Bothy again, this time through the great mountain pass of the Lairig Ghru. Deep snow and mist high up in the pass. The Pools of Dee were icy and ethereal. The descent and hike on through the valley, under Ben MacDhui towards Corrour was a hard hike with heavy packs through knee deep snow. It was even harder back through the Lairig Ghru the next day, but we were rewarded with clearing skies and views of the crags. 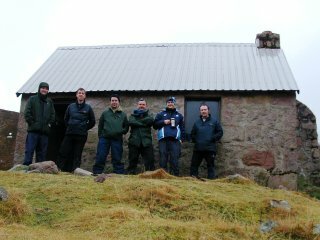 We decided to spend the shortest day, and longest night of Winter solstice 2005 at Corrour Bothy. Under the Devil's Point, at the Braemar end of the Larig Ghru and the scene of several accounts of possible encounters with the Big Grey Man of Ben MacDhui, Corrour Bothy was a cold but very welcome shelter from the night. Corrour Bothy used to be known as an ice-box. We managed to get the inside temperature of up from 6 deg c to 13 deg c with some of the 20 kilos of coal we'd carried in. Scottishhills.com gourmet division laid on a festive venison casserole, and mini Christmas crackers were produced. At some point in the night, a small herd of deer visited the bothy. Windchill and high level visibility precluded a safe ascent of Ben MacDhui on Dec 22nd, so we walked out to the Linn of Dee. This project would not have been possible without the hillcraft, creativity and sheer packhorse stamina of members of the Scottish Hills community. Visit us at our other online home!